I am sure by the end of this week, and then maybe the fall, y’all are going to be SQUASHED out! But seriously I am addicted to the stuff and love how versatile it is. You can throw it in anything and be reassured that not only will it taste GRET but you’ll be getting a bountiful amount of vitamins & minerals in each bite! I mean what else can you ask from these earthly gourds? My first memories of eating Acorn Squash was at my grandmas house where we would have it as a desert/side in the winter and THE ONLY way I would eat it was filled with butter and brown sugar (YUM!!!) I can still remember thinking it was weird people would eat squash WITHOUT brown sugar on it. I am so glad that my grandma introduced us to squash as kids, even if it was piled with yummy brown sugar, it opened the door and my mind to this food! When Brent & I first dated back in Texas there was a cold fall day & a pinterest recipe for stuffed acorn squash, which resulted in a Midwest-transplant-dinner on my “kitchen” table (really a bar top with a leg bolted to the wall, thank you reserves apartments! )… I used the wrong kind of sausage & it not only took forever to make but it was a MESSY process. BUT Brent loved it! I am not sure if it was just real food and he liked that OR if it was flavors of fall and reminded him of home. Regardless he remembered me making this meal and has often brought it up. This was the reason I went to the squash bin with the intention of buying ONE squash (and came home with 5!). My inspiration for this stuffed squash bounced between southwestern and Italian, & ultimately was decided because my sausage was mild Italian seasoned. I found a recipe online which I used as a veryyyy loose guideline for this stuffed squash recipe. I have to say this dinner really came together seamlessly, during the time it takes to roast the squash you can have the quinoa cooked, the veggies chopped and the filling made right in time for the squashes to come out of the oven! Left: squash pre-roasting, I sliced the very bottom off so the squash stands on end! Right: Sausage & veggie filling. YUM! fresh out of the oven ready to eat! These are the amounts that I made for this recipe but please know you WILL have leftover filling!! This is not a bad thing in my mind as I eat leftovers regularly and can see a deconstructed “stuffed” acorn squash for dinner in the very near future. BUT if you would like to make this for more people the amount of filling in this recipe would likely fill 6 “normal” sized acorn squash halves (or 3 squashes for those mathematically impaired like me!). Needless to say Brent enjoyed this acorn squash enough to forget how much he liked the first one! GIRLFRIEND WIN!! I truly hope you all enjoy this recipe! Please know that the vegetables and spices can easily be interchanged with your favorites. I love the versatility of the stuffed squash! 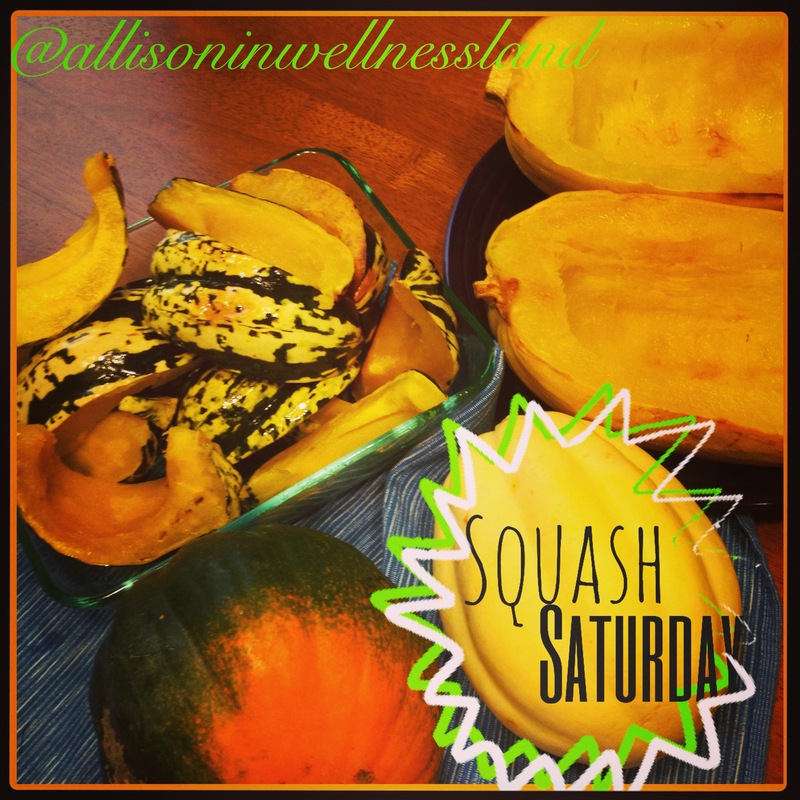 Stay tuned tomorrows wellness wednesday has yet another great use for squash! I’d Love To Know ~~ Whats your favorite squash? Have you ever made a meal that was as impressionable as my original acorn squash recipe?